You choose various investment options like Equity, Debt, Diamonds, Gold, Silver, Real Estate, Commodities, Antiques, Paintings, Carbon Credits, Forex, Derivatives etc. You have to invest your money wisely so that your assets grow and generate good returns, well above rate of inflation. So, ‘Which one is best investment option in India in 2019?’ is a common question which will come to your mind. So, let us go through various investment plans and options in India and find out which one is best. We peep into heart and soul of the different assets to find out the best one. It is the safest investment option and preferred debt instruments are FD’s of Nationalized Banks, Post Offices, and Government Bonds etc. Let us see how do they operate, function, pay us the interest regularly and return our principles in time. They borrow from us at low rates and lend it higher rates to small, big business, corporations, development projects. Majority of these borrowers, entrepreneurs, companies, actually perform well, pay interests, and repay loans-principals to banks and still make a profit for themselves. That is why all Nationalized Banks, Post Offices, Pay us Interest Regularly and repay our principals without fail and still make a profit. Actually our so called Safest Investment Income-Interest paid by Nationalized Banks, Post Offices, is thus created by these borrowers, companies, entrepreneurs, who fulfil some social, economical, echnical, practical, need of man kind efficiently and effectively. Thus, wealth is created by some kind of entrepreneurship only which adds value for the betterment of society at large. More over becoming a banker, a company is necessarily entrepreneurship which creates value by bringing together two needy groups – lenders the people and borrowers the entrepreneurs, businessmen. Banks also finance housing, help customers-home buyers in creating an important asset for them. Banks also widen and make faster customer reach by financing vehicles to them. Right from dawn of civilization anywhere and everywhere we see that entrepreneurship alone has bettered human lives by innovating, inventing right from fire, wheel, lever, farming to planes, and robots and so on and adding value for betterment of society at large. So, debt is a secure investment option. It is when you don’t want to take any risk and want moderate return on your investment, you choose debt. It is not the best investment option. Let us move further to more investment options. Gold is a precious metal. But, It remains stagnant, static and it is static passive asset. 100 grams of gold does not increase to 105 grams nor decreases to 95 grams. Nor its purity changes from 22 Carat to 24 Carat or vice versa. It does not grow, change, quantitatively nor qualitatively. So, investing in Gold is nothing but mere commodity than asset or investment option. Price fluctuations in these assets are solely due to the forces of demand and supply and not due to any change in their intrinsic value, real worth. But, Gold though a static passive asset is a special commodity because of all its qualities, beauty, indestructibility, condense value, universal acceptance, liquidity and so on. A jeweller, an entrepreneur adds value to gold by making beautiful ornaments and sells them at a profit. But, the same jewellery loses value when brought back for resale. It has been observed normally that Gold prices shoot up when there is recession; stocks are stumbling, uncertainty, lack of confidence and vice-versa. Statistics regarding Gold prices over last 400 years have established that Gold has always preserved the purchasing power but have given very little real Returns. Exceptional Returns in patches have been nullified by low or negative returns at other times. So, Gold also is not the best investment option, rather it is commodity and static passive asset. Returns are also uncertain. Diamond is one of the most expensive crystals in the world. In India, a one carat average Diamond costs around Rs. 3 Lakhs (where as a 3 carat Diamond was costing Rs. 50 Lakhs. Its extremely condensed value and portability bestow Diamond as a form of emergency funding for the dictators, Rulers, Super rich on a panic flight. Like Gold, Diamond is also a commodity. It remains stagnant, static. It is static passive asset. If you buy a 2 Carat diamond, keep it for 20 days or 20 years, it does not grow to 3 Carat nor does number 1 diamond become number 2 diamond. It has no fungibility. Being brittle, it could be easily scratched, damaged. Therefore, difficult to maintain. Large number of variables in quality makes pricing difficult, subjective. Hence, no loan is given against Diamond as security. Because of all this no terminal market for Diamonds, resulting in no liquidity. So, Diamonds are not at all an investment option for anybody. You can buy diamond and it may be used to show-off of possessing an expensive gem. Let us proceed further to find out our quest for the best investment plan. Silver is a poor cousin of gold. Like Gold, it is also a static and passive asset. It is also a commodity than investment option. It gets affected by climate, get oxidized, more volatile and less liquid than gold. Generally the turnover of Silver is around 2% of Gold in value. It is not a good investment option. It has only ornamental value. People say, real estate is the best and safest investment option, is it? Real Estate rather is a high investment option. You need minimum 15-20 Lacs to buy some property in tier 3 cities. Further, transactions of R.E. are always risky because of problems in title disputes. There are many frauds noticed. Transaction cost is also high i.e. around 10% of the cost. R.E. has very little liquidity. You can sell 1 tons of Gold worth Rs. 300 Crores & realize the money in couple of days. But, when you are in dire needs, you may not get even ¾ th the price of a single bed room flat in a whole year. You need through knowledge, lot of Experience, perspective & lots of money to buy right type of R.E., at the right place at the right time & price. Over and above, this one needs holding power of 5 years to 10 years to make R.E. investment safe & profitable. This is not easy proposition for most of us. Like a stock market or Gold markets, there is no market as such for R.E. where proper price discovery takes place. 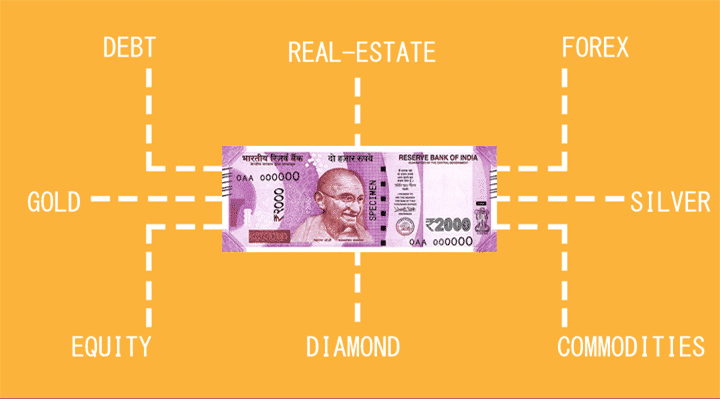 Real estate is also static and passive asset. A 1000 Sq.ft. flat, 10,000 Sq.ft. plot, or 10 acre farm land change or grow automatically even if held for 20 days or 20 years. Real estate is also very special static passive asset which has very important essential uses in every sphere of our lives. Owning a house is lifelong ambition matter of sentimental- emotional satisfaction for almost every one. Of course R.E. is tangible in real sense, has some important uses like constructing your home, houses, school colleges, factories, roads, shopping malls, offices and so on. Thus, entrepreneurship can add great value to it. You have to consider all the above circumstances before investing into Real Estate. Real estate is also not best investment options. Keep your curiosity on before we move on to more investment options. The interested and Super Rich can buy Painting/Antiques for showing off. These have lack of fungibility, affected by time, and climate. They do not have terminal Market and liquidity. Further, 2 number of paintings/ antiques do not become 3 number of paintings/ antiques in some days or years. And it does not grow, change, quantitatively nor qualitatively. It also remains stagnant, static. It is static passive asset. Hence, this is of course not good investment option. It is a credit received for preventing 1 ton of CO2, Green House Gases from going into the atmosphere by using green renewable energies. It has little liquidity. Perhaps ok for companies involved in Energy Business, but certainly no good investment option for individuals at least now. Some traditional examples of commodities are grains, gold, oil and natural gas etc. Recently, it has included products like foreign currencies and indexes. Commodities are traded on commodities exchange. Some of the Problems associated with commodities are storage, decay and quality variables make valuations difficult. It may be good for the Traders in the particular commodity. But, otherwise a risky investment option with little logic. The term Forex stands for Foreign Exchange. Forex trading is the trading of currencies from different countries against each other , for example US Dollar against Euro. So, Forex It is not an asset, but a contract on exchange rates. It is speculative, not an asset, not an investment option. Derivatives are a contract on underlying assets and not the assets. It is very risky and certainly not a prudent investment option. Buying a share of a company means buying the smallest unit of ownership in a company or an enterprise. Out of the more than 5000 Companies which are listed on BSE and NSE, there are many good companies growing at a Compounded Annual Growth Rate (CAGR) of more than 18 %. This means their Net Profits (N.P. ), Earning per Share (EPS) are becoming double in every 3 to 4 years. Consequently, their book values (B.V.) and real worth are also growing & doubling every 3 to 4 years. Let us take some examples of companies which have given outstanding returns. For example, Infosys is a software giant. If you had invested Rs. 1,00,000/- in Infosys (INFI) IPO in 1993, you shares would have been value of Rs. 30 Crores now. i.e. 3000 times increase. This tremendous growth in share holding works out to be at a CAGR of more than 40 % means the stock doubled in value every 1.80 years. IPCA Labs grew at more than 17 percent Compounded Annual Growth Rate (CAGR) from 2009-10 and 2013-14 Its Earning Per Share (EPS) of Face Value Rs. 2 grew more than 2 times from Rs. 16.75 in 2009-10 to Rs. 37.83 in 2013-14. Book Value (B.V.) also increased more than double from Rs. 69.86 in 2009-10 to Rs. 157 in 2013-14. Net worth got doubled from Rs. 874 Crores in 2009-10 to Rs. 1980 Crores in 2013-14. Net profit (N.P.) also got doubled from Rs. 209 Crores in 2009-10 to Rs. 477 Crores in 2013-14. The share capital was unchanged at Rs. 25 Cr. This means that intrinsic values of Infosys and IPCA shares got more than double during these respective periods around Compounded Annual Growth Rate (CAGR) of more than 18 percent. The true value, real worth of these shares increased, doubled on their own in 3 to 4 years. There are always many such examples and companies. This clearly shows that shares of good growing companies are always growing in real-intrinsic values-Earning Per Share, the book values. Hence, they are truly growing Active and Dynamic asset. So, investment in good and growing equity is investment in an active, growing dynamic asset, always increasing in real value. When the true- intrinsic- real value of the asset is growing, the market value of the asset is bound to go up sooner than later. All the assets except equity are like mere commodities. They can’t do anything on their own, remain stagnant and hence are static, passive assets. Price fluctuations in these assets are solely due to the forces of demand and supply and not due to any change in their intrinsic value, real worth. These assets do not grow, change, quantitatively or qualitatively. They remain stagnant and static. These are static passive assets. After peeping deep in to the hearts and souls of all these assets, it is crystal clear that human entrepreneurship, dreams, expertise, alone are always responsible for value addition, wealth creation in this world. And from the point of view of investors amongst the top most human enterprises are the good corporate companies listed on B.S.E. and N.S.E. for the many advantages of investing in the listed companies. We have seen that all the investment assets except equity cannot change or grow in their real-intrinsic values. Hence, all these assets except equity are stagnant, Static, Passive, Assets. For getting any returns from these assets, you have to solely depend on the forces of demand and supply rather than any growth in their intrinsic value which is impossible. Mere and total dependents on the forces of demand and supply for price increase, returns, are speculative, risky, unscientific approach. It is crystal clear that the human entrepreneurship alone has been and always will be responsible for creation of all the wealth in this world. The best avenue for investment in this good entrepreneurship is investing in good growing equity shares of good growing listed companies growing in real worth, intrinsic value all the time as seen in the examples of Infosys and IPCA LABS. Hence, equity shares of good growing companies, growing all the times, in intrinsic value real worth alone are Active, Dynamic, Creative, Assets and hence undoubtedly the very best Investment Option and Asset Class. on Wealth Management in premier Institutes like IIMs, ICAI, Chambers of Commerce, Persistent, L & T, and Siemens etc. You can contact him at kelkar126 @ gmail.com. I think equity investment is best option….investing in shares might be risky..but if you target the blue chip companies they are more stable and safe to invest….Mutual funds hence are considered as safe to get good returns…good post to learn about investment ideas and making money..! !